Trinidad and Tobago won the Shell/Umbro cup last night by beating St. Kitts and Nevis 4-0 at the Antigua Recreation Ground. The victory was anti climatic as they accomplished their goal for the tournament by beating Jamaica in the semi final. It was the effort of the twin strike force Jerren Nixon and Peter Prosper that did the job for T&T. The party began in the second minute. After the T&T defense broke down a St. Kitts attack, defender Marvin Andrews sent a long ball forward to Nixon. The St. Kitts defender was under pressure and let the ball bounce over him. Nixon ran past his man and shot past the advancing goalie. T&T had the advance throughout the game. The five man midfield of Nahkid, Angus Eve, Dale Saunders, Colvin Hutchinson and Lyndon Andrews had their way with the out matched St. Kittians. In the 28th minute Marvin Andrews powered a shot off a Lyndon Andrews corner kick, past the goalie again. T&T had several chances again, however power finishing and desperate defending kept the scoreline 2-0 in T&T's favor at the half. In the second half, things basically remained the same for T&T as in the first half. In the 46th minute Jerren Nixon pounced on a ball that seemed to be going out. He squared it to teammate Peter Prosper who headed it past goalie Maloney to put T&T three up. The Red Army started to play more reserved after that. They created several chances and the persistence paid off with T&T's fourth goal. Prosper made a great solo run down the right flank. He dribbled into the penalty area, was disposed of the ball, stole the ball back and shot past Maloney to complete the victory. Coach St. Clair made several changes in the second half by bringing on three young players. St. Kitts found it a rough go as they created few chances and was stopped cold by the defense and the hot hands of Clayton Ince. The awards have did not stop with the presentation of the Shell/Umbro trophy. 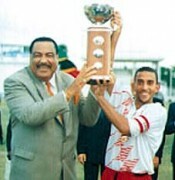 Clayton Ince celebrating his birthday became goalie of the series and Nixon was name Caribbean Football of the Year.